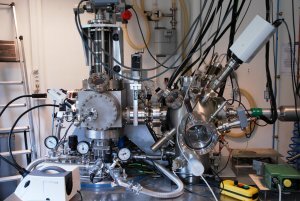 After 9 years of developpement, M3 is fully operational since 2008.
a stiff STM microscope with a large XY displacement (3mm). 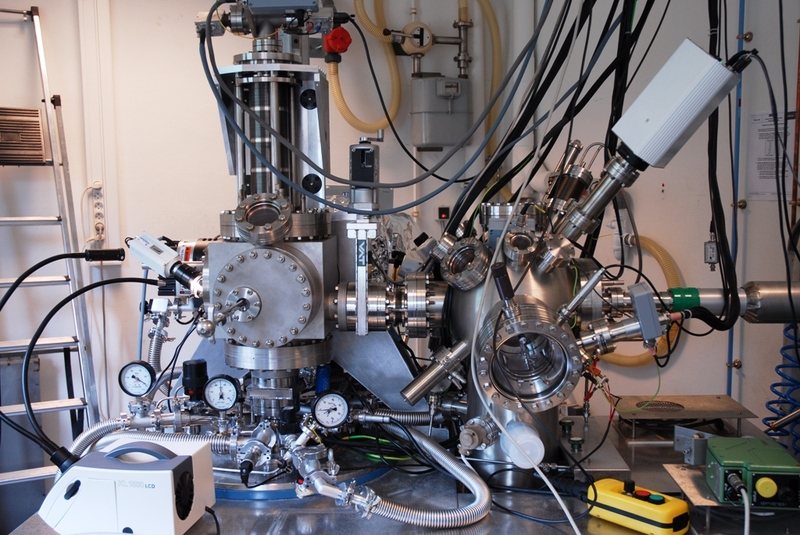 a true UHV environment (10-11mbar)allowing us to prepare and characterize samples in-situ. an ultra-low temperature 300mK of the STM head, tip and sample. 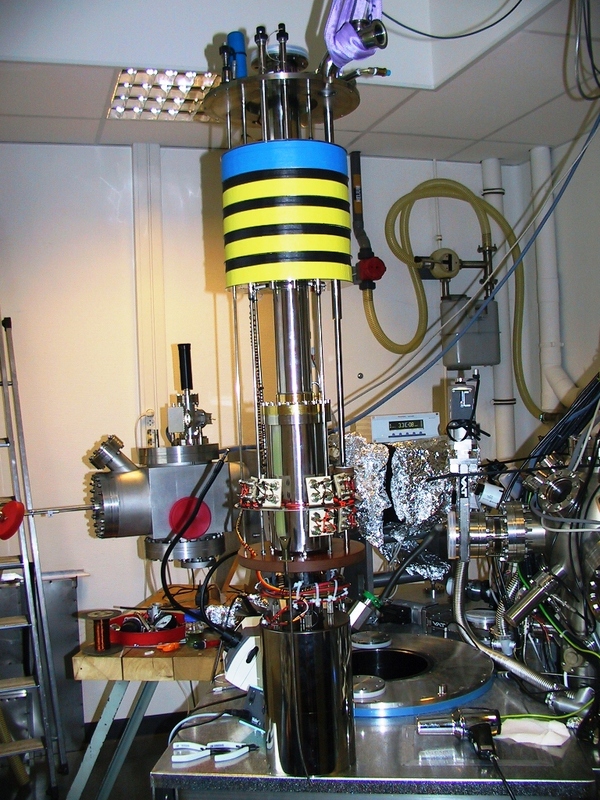 a high magnetic field : up to 8Tesla at the sample stage. 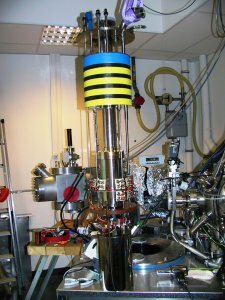 M3 consists of 2 interconnected UHV chambers : the preparation and the STM chamber. 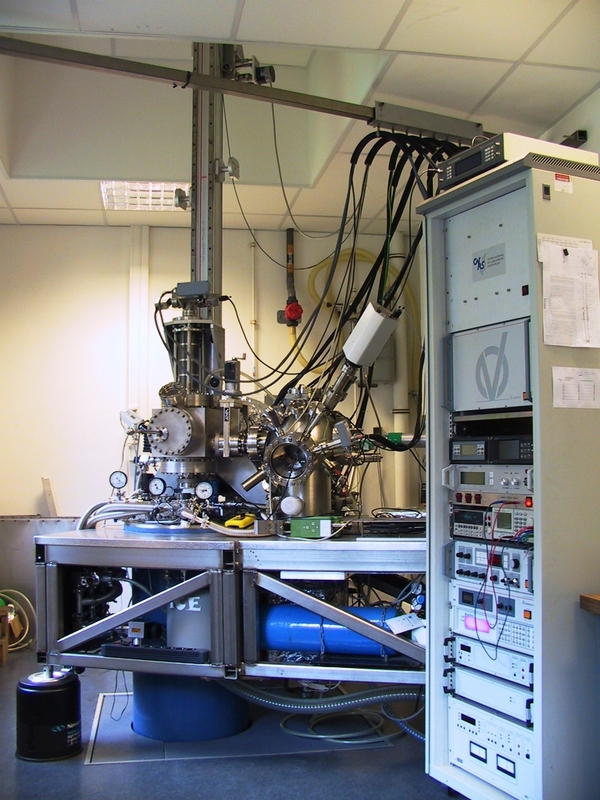 Both chambers and cryostat lie on a rigid bench supported by 3 damping legs. 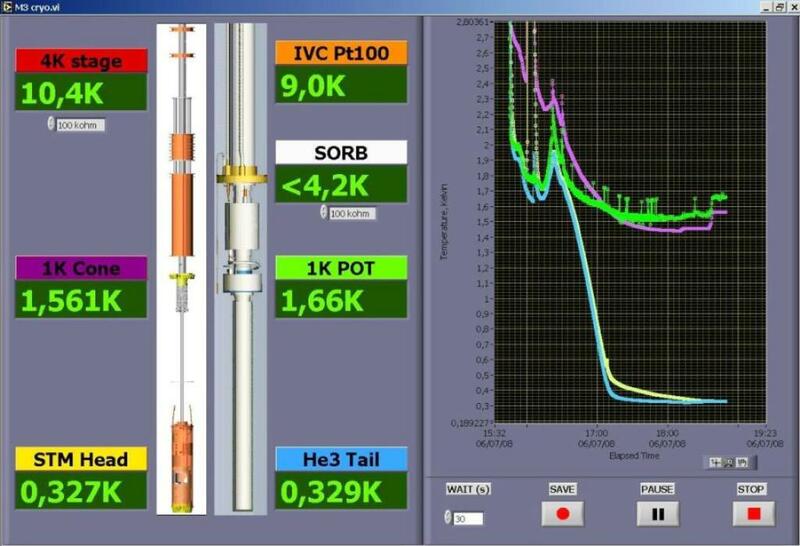 When operating the STM head is “top loaded” into the UHV cryogenic system where the magnet stands. triple evaporator with electron bombardment and quartz balance. A Low energy electron diffraction and Auger spectroscopy analyzer. 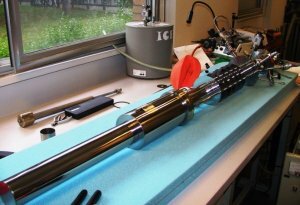 A resistive and direct current heater on a transfer rod. A liquid nitrogen cooling system allowing cooling down samples to 130K. The STM chamber is equipped with a carousel for storing 6 samples (or 6 tips) and a cleaving stage which can be cooled to liquid nitrogen temperature. The STM head is designed for the commonly used Omicron sample plates. A xy stage on piezoelectric stacks enables large displacements (3x3 mm2). The STM head is very stiff to minimize mechanical vibrations. 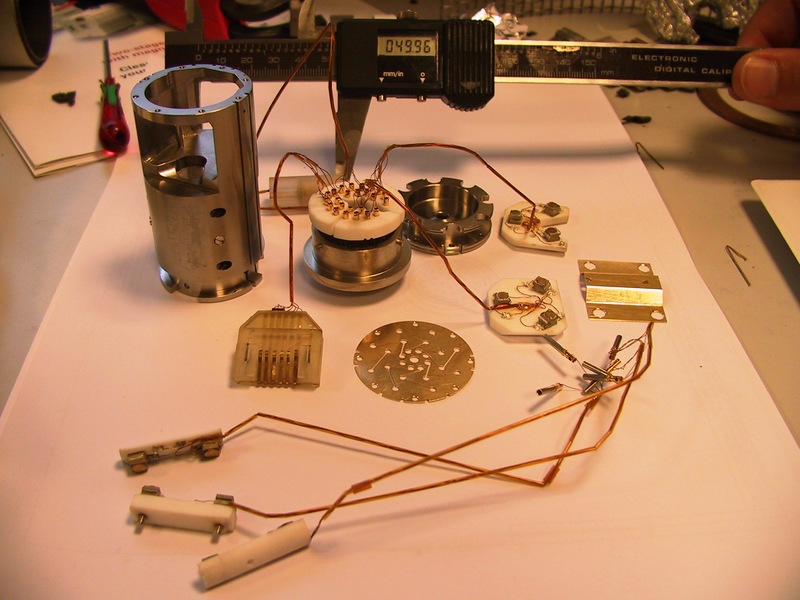 It is also compact for providing a homogenous magnetic field during low temperature experiments. 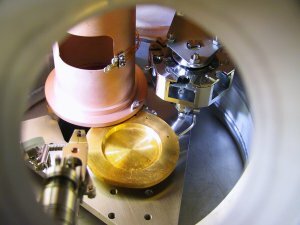 The cryogenic system of M3 consists in an Oxford Instruments He4 super-insulated cryostat with a coil producing 8T (10T with lambda plate extra-cooling) and a Helium3 insert specially designed by our team and built by Ice Oxford. The ultra-low temperature cooling is achieved with a “single shot” He3 condensation : A sorption pump containing He3 is heated, increasing the He3 pressure in the cold finger. 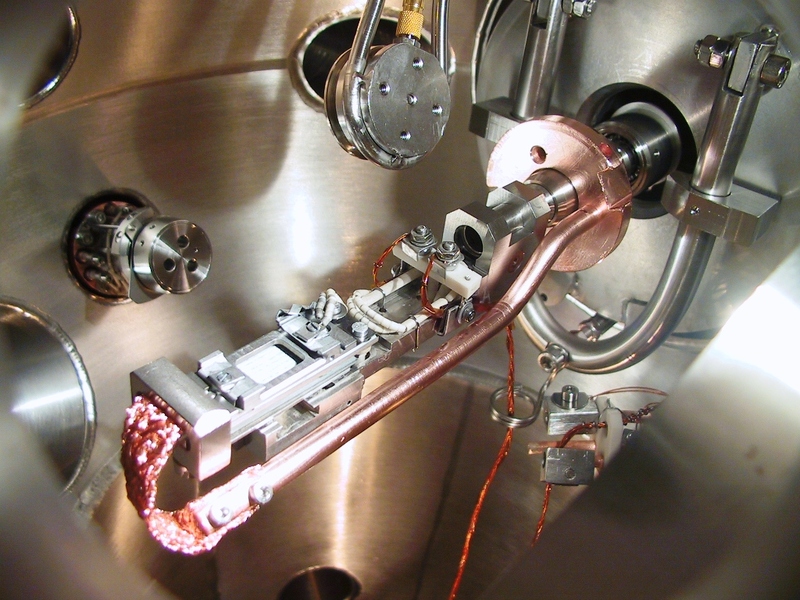 In parallel, a pot is cooled at 1K thanks to a capillary where He4 liquid is flowing (pumped from the cryostat bath). He3 then condenses at the external surface of the 1K-pot and falls in drops directly in the cold finger connected to the STM head. When the He3 pressure become too low to continue condensation, the sorption pump is allowed to cool down and starts to pump the liquid of the He3 bath. As a result, the cold finger is cooled to 300mK. The STM head is surrounded by the cryogenic system and plugged on the UHV side of the cold finger so it can be cooled at 300mK. The Helium3 condensation process during a shot needs a very fine monitoring of the all the cryogenic components, especially of the 1K pot and the sorption pump. A dedicated program under Labview has been developed to this end.